Last week marked the 59th anniversary of the final days that led-up to the end of the Second World War. In Bohemia those fateful days were defined by the Prague Uprising, which saw some 30, 000 take up arms in the Czech capital against their German occupiers. Though the Nazi grip on Bohemia and Moravia began to weaken, the threat of newer Nazi atrocities grew with every passing hour. 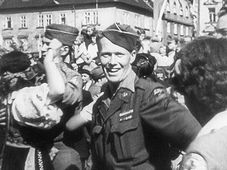 "At that moment the war was not yet officially over, it was necessary to do something against the Germans because the Germans were concentrating around Prague. They had about 1, 100, 000 soldiers and weapons. That would have destroyed our country, which was most probably in Hitler's plan. Before his death Hitler gave strict orders that the war must continue up to complete destruction: Prague would have been destroyed." 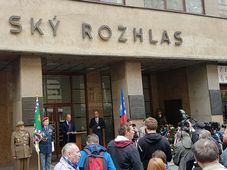 At roughly half-past noon on Saturday, May 5th, Prague radio broadcast an appeal to all Czechs to come to the radio building's defence: it was the beginning of five days of fierce fighting in Prague. The uprising would come at a terrible cost: more than 3,000 would die. "Everywhere there were very hard battles. In the first days the Germans had quite a lot of force to destroy those who were trying to do this military thing - that means our friends! But later, around the 5th they were a little bit frightened, too. They were furious but in this furiousness they were killing. The uprising started in Prague: you could see in the streets, as I saw it myself, people with guns, what was before absolutely impossible. Guns that had been hidden away somewhere, underground, in caves, and flags. It was just the start. But, nobody knew what was practically going on." "The first clear start was on the 5th before noon: there were practically two big groupings that could lead the uprising. One group was called the Czech National Council, founded only several weeks before. In their ranks were different groups of fighters including communists, Sokol members, boy scouts, and many normal people from ordinary walks of life; that was one faction. The other was more political, the National Committee. Also key in Prague were two military groups led by generals. Many of these groupings were wise enough to obey and concentrate their strengths together and not fight against each other." Barricades First the Czechs attempted to take back their streets: building barricades in Prague from any material they could find. They overturned vehicles, laid metal, and unearthed hills of cobblestones, piled-up to block-off important avenues against the onslaught of German tanks. Still, those involved knew they could only hold for so long: fighting was intense, often from block to block. Hope also hung on Allied promises. As the Germans retaliated with brute force, an appeal was broadcast in English from Prague radio by a Scottish escaped prisoner of war, calling for Allied help. "Prague is in great danger. The Germans are attacking with tanks and planes. We are calling urgently our allies to help. Send immediately tanks and aircraft. Help us defend Prague. At present we are broadcasting from the broadcasting station, and outside there is a battle raging." 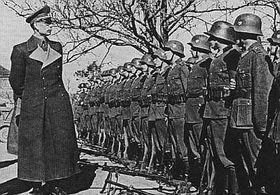 General Vlasov and his army "The Vlasovs: that was a part of the German army made up of Russian soldiers who were imprisoned by the Germans and who turned sides. General Vlasov was ill at the time but he sent General Bunachenko and really they helped us for two days. We had practically nothing left. Without their help I do not know what would have happened. After May 7th most left Prague, so we were alone. The others went away and afterwards were captured by the Russians and shot." 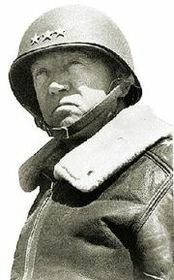 American forces led by General George Patton had also entered western Bohemia but Patton was explicitly forbidden from going further than Pilsen, which his forces had reached. "Patton phoned Eisenhower and said 'Tomorrow I'll phone you from Prague'. But Eisenhower said 'No'. So, that was a very bad situation because just in these days, the last days of the uprising, the 7th and 8th and so on, we were alone." General George Patton If Patton regretted not being able to go further he did at least do this: a curious order that helped prevent further bloodshed. "From the western allied armies Patton secretly sent a small Jeep with three French officers to Prague. And these three came to Prague and saw what was going on in the Prague district of Smichov. There, there were SS Wallenstein soldiers, so they asked to be presented to the chief commander of the SS. 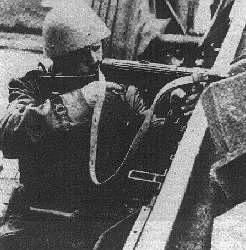 And, they gave him the order to immediately stop all fighting in Smichov, and this SS general did it. 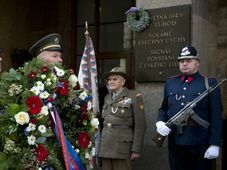 That means they 'liberated' at the last moment, absolutely the last moment, Smichov." 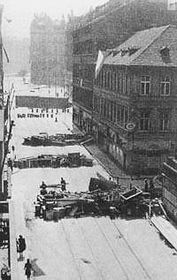 The Prague Uprising, May 1945. After 59 years it still remains vivid for Antonin Sum; though he himself did not take part in the barricades, he did see the carnage and destruction. The bodies strewn in the streets, the terrible sacrifice. 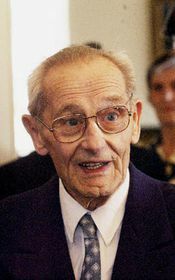 After the war, no doubt he like many others expected a new start, but too soon it would all turn bitter: liberation at the hands of the Soviets and the decisions at Yalta, paving the way for the Iron Curtain that would soon condemn Czechoslovakia to totalitarian rule. A regime that always downplayed the Czechs' heroics in the Prague Uprising, while stressing the liberating hand of the Soviets.